The most frequently asked question people ask is ‘How long does it take to make a sculpture? I usually answer ‘40 years’ experience!’ But in truth, it is very difficult to quantify. An idea may be bubbling about in the back of the mind for months, weeks or days, or I may see some situation which immediately inspires the design for a sculpture. Then there is the time creating a maquette, or small working model, ordering the stone, or other materials, spending several weeks, or maybe months creating the sculpture, before hours of refining and finishing. 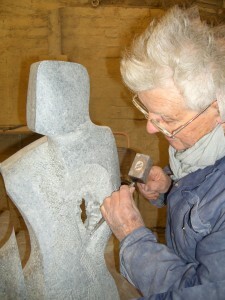 In fact it is very often the sanding of a stone sculpture, working through many grades of ‘wet-and-dry’ sand-paper which takes hours and hours before the final polishing. If it is a cast sculpture, there then is the period at the mould makers and the foundry. The patination of some pieces needs to be worked on to create the desired finish whilst larger works and garden sculptures often have plinths which have to be sourced or created. In the case of a commission for a sculpture, there are meetings with the client, countless emails and discussions, before producing a maquette for approval. Estimates for the installation and casting must be obtained before beginning on the actual sculpture.